This is Lusi. 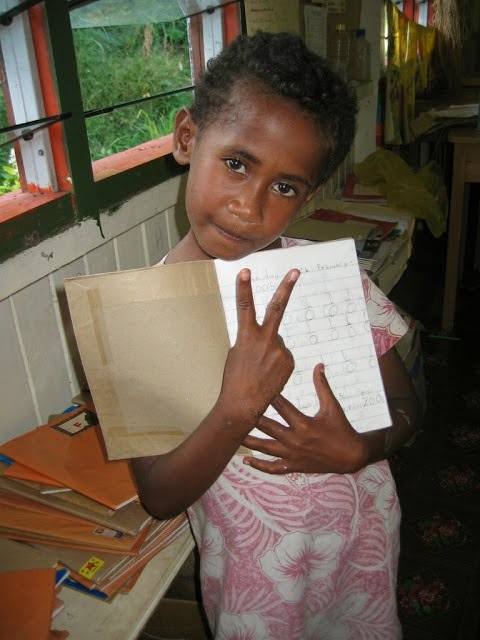 She was a shy but friendly five year-old about ten years ago, who took me by the hand when I arrived in her remote village in the Yasawa Islands in Fiji, and showed me proudly around her bare-bones school. There was neat cursive handwriting on the blackboard, a single netball hoop in a circle of beaten dirt in the playground, and a mixed group of cheerful pupils waiting to sing songs for us - like 'The Wheels on the Bus', on an island where there were no buses or cars, or probably even much in the way of wheels. But it seemed a laid-back, comfortable sort of life under the palm trees there, surrounded by warm seas full of fish. I always wonder though, whether they saw us white visitors from our even whiter ship out in the bay as just a diversion, or as a source of envy. In lots of third-world places on the tourist trail, we're seen as a resource, and that's fine; but in the endless quest to divert from the beaten track (as much for mere bragging rights as anything else) many communities are being introduced to things they've never dreamed of, and could never attain; and that way lies discontent and disintegration. It's the traveller's conundrum: how to discover and explore new places, without destroying them in the process. We're all Livingstons, in our way.